Palm Bay: The Santiago Post. Palm Bay City Councilman Harry Santiago made a post in a group which concerns the special assessment and the group that is going around collecting signatures to repeal the Charter Amendment that was passed last election. We’d like to break this down a bit. The first thing Santiago says is that the “few petitioners” have “no real solution” to the infrastructure issue within Palm Bay. We wonder if the City of North Point knows that? It makes it difficult to “trust” and accept the words of an elected official when they contradict themselves. Santiago makes the point that people need to understand that consequences of going back in time. He points to the “transparency” of the City when it comes to the infrastructure projects. Before the election, the City correctly pointed out that the vote on the special assessments was critical. We agree. It was and is. The infrastructure of the City is important. What was missing in the discussion before the election was rates, or rather the proposed increase in rates. When 54% of the voters voted for the ability of the City Council to raise special assessment fees, what no one knew was that the City was planning on a 400% increase in the fees. If the City were truly being “transparent” as Santiago claims, the City would have disclosed the projected increases. Although they are not legally required to project costs as other State wide Constitutional Amendments are, we believe that the very same voters Santiago wants to “thinks about this” were left without one critical piece of information – the proposed rate increases – before the 2016 election. To illustrate, let us assume that there was an election concerning the death penalty. “Should the death penalty be allowed?” reads the question on the ballot. Most people people are for the death penalty and the measure passes. Later that year, a person is arrested for speeding and sentenced to death. Yes, death. That’s the same “logic” that three members of the City Council (including Santiago) are using. Yes, the voters did vote the City Council the authority to raise the special assessments and believed the Council would act in a responsible fiscal manner. The assessments came out and people were incensed. They felt they had been lied to. They felt the rates were exorbitant. When people spoke on the rates themselves, they were dismissed and that is a shame. What Councilman Santiago, Councilman Holton and Councilman Anderson missed was a great opportunity to prove to the people that the City could spend a transparent, reasonable increase in assessment fees responsibly. The people would have accepted that. In the same thread, Santiago misses another opportunity to do the right thing as opposed to doing nothing. One of the leaders of the petition group makes the claim that Santiago was wrong in using his position within the Council to make the post instead of posting as a private citizen. Our initial indication is that as long as Santiago is not putting forth how he will vote on an issue, he is fine under the Sunshine statutes. …..to make you happy I will ask my City Attorney for his legal opinion. 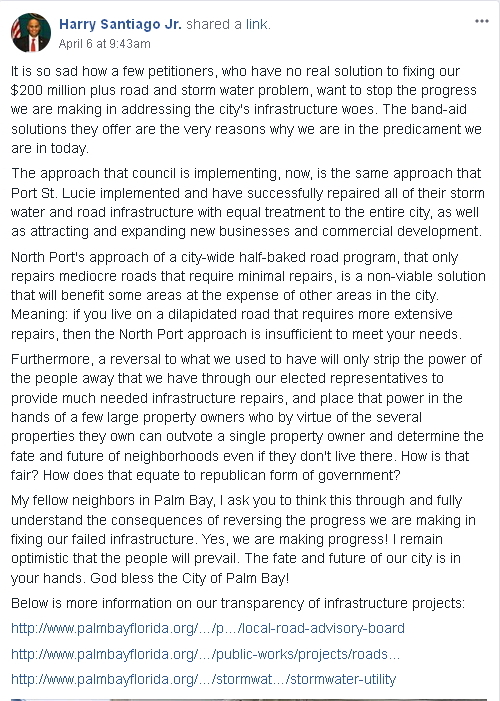 We would have felt better if he had said “the City Attorney,” but it does highlight the idea that the City Attorney does not work for, nor protect, nor has the people of Palm Bay for clients. It is the City Council that is the client. This manifests itself in the form that even if the Attorney feels the Council or a Council member screwed up, they are legally bound to defend that Council person rather than protect the interests of the people. Yet that is not what bothers us. Santiago is informed by several members of the petition group that City employees have been told not to sign the petition. ….. It is not fine when people are being told not to sign the petition. That is not right. No one in the city or council has ever done so to my knowledge. I never told anyone what they should do as far as the petition. I only give my opinion. But obstructing free speech is unacceptable. ….if that’s the case, I would be vehemently against it. Our 1st amendment rights is very important. I will defend it vigorously. Here again Santiago missed a chance to do the right thing and instead did nothing. It is a missed opportunity to back up his words with actions and rebuild the trust of the people when it comes to the City Council. Are we castrating Santiago because of that? No. And we don’t want to make it seem that we are. We believe that when a City Council member hears something that is clearly wrong, they should take it to the correct people within City Hall and make sure either that wrong is not happening or is corrected. In short, we hope we have made our position clear that the people of Palm Bay are not against the special assessments, but rather are against the rate increase which the City never disclosed before the election. We believe the City, the Council, and the people would have been better served with a lower, measured rate which would have restored some trust from the people. Finally, we would rather see people actually work to defend First Amendment rights rather than say “we are for the First Amendment.” Actions do speak louder than words, you know. I thank RoH for the in-depth viewpoints. Sometimes I would wish for a more concise tutorial, and a little bit shorter in volume. Santiago is being disingenuous. His go along to get along RAISE TAXES so we can spend them proves to all of us, he should have never been given the chance to become an elected official. How embarrassing he, Holton, Lynk, and sometimes Anderson have been for the City. It seems obvious that Santiago believes the crude coming out of his mouth, and thinks he would be a GREAT MAYOR?? Nothing is further from the truth. This clique needs to be removed, including Isnardi’s new member of the Kabal, Parr. I’m glad to see that someone agrees with Mr. Guame about the North Port project. It’s hard to argue with success. Then again the City of Palm Bay has intentions of following up the failure of their Bayside CRA, with yet another TIF funded microeconomic zone. “At dinner Saturday night I had the chance to have a conversation with the American Legion Post 254 Commander from North Port, FL. Of course I asked him about his road and stormwater referendum and his impression of the entire process and value. I wanted the opinion of an involved Citizen, not anyone affiliated with the City in any way. I’m happy to report that he said the project exceeded expectations of the community. Was done on time, and was in his opinion a total success and a great value. I’m happy to hear that feedback, but just as discouraged that our own City leadership will not give this a honest investigation, as it doesn’t seem to fit their agenda. From a conversation I had with Mayor Capote several months ago, leaders from North Port actually came here to talk to Palm Bay’s leadership team, and were not even given the common courtesy of an open minded meeting to hear of North Port’s success, and a possible solution for Palm Bay. I’m glad to see someone is actually doing some research and not simply relying on Palm Bay’s city staff to feed them information.